For other uses, see Thistle (disambiguation). Cirsium arizonicum, showing arachnoid cobwebbiness on stems and leaves, with ants attending aphids that might be taking advantage of the shelter. Carduus nutans in the early morning light. Thistledown, a method of seed dispersal by wind. The tiny seeds are a favourite of goldfinches and some other small birds. Thistles, even if one restricts the term to members of the Asteraceae, are too varied a group for generalisation; many are troublesome weeds, including some invasive species of Cirsium, Carduus, Silybum and Onopordum. Typical adverse effects are competition with crops and interference with grazing in pastures, where dense growths of spiny vegetation suppress forage plants and repel grazing animals from eating either the thistle plants or neighbouring forage. Some species, although not intensely poisonous, do affect the health of animals that swallow more than small amounts of the material. Conversely however, the genus Cynara includes commercially important species of artichoke and some species regarded as major weeds are commercial sources of vegetable rennet used in commercial cheese making. Similarly, some species of Silybum that occur as weeds, also are cultivated for seeds that yield vegetable oil and pharmaceutical compounds such as Silibinin. Other thistles that nominally are weeds are important honey plants, both as bee fodder in general, and as sources of luxury monofloral honey products. Thistle flowers are favourite nectar sources of the pearl-bordered fritillary, small pearl-bordered fritillary, high brown fritillary, and dark green fritillary butterflies. Thistles (and thistle-seed feeders) also attract goldfinches. Some thistles (for example Cirsium vulgare, native to Eurasia), have been widely introduced outside their native range. Control measures include Trichosirocalus weevils, but a problem with this approach, at least in North America, is that the introduced weevils may affect native thistles at least as much as the desired targets. Thistles have been said to be very important nectar sources for pollinators. Some ecological organizations, such as the Xerces Society, have attempted to raise awareness of their benefits, to counteract the general agricultural and home garden labeling of thistles as unwanted weeds. The monarch butterfly, Danaus plexippus for instance, was highlighted as traditionally relying upon taller large-flowered thistle species such as Tall thistle, Cirsium altissimum, for its migration. Although such organizations focus on the benefits of native thistles, certain non-native thistles, such as Cirsium vulgare in North America, may provide similar benefits to wildlife. Some prairie and wildflower seed production companies supply bulk seed for native North American thistle species, for wildlife habitat restoration, although availability tends to be low. Thistles are particularly valued by bumblebees for their high nectar production. Cirsium vulgare ranked in the top 10 for nectar production in a UK plants survey conducted by the AgriLand project which is supported by the UK Insect Pollinators Initiative. 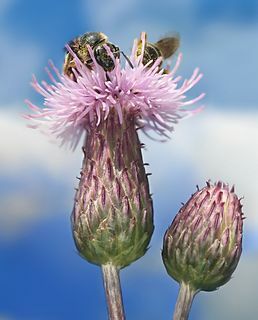 Bull thistle was also a top producer of nectar sugar in another study in Britain, ranked third with a production per floral unit of (2323 ± 418μg). Maud Grieve recorded that Pliny and medieval writers had thought it could return hair to bald heads and that in the early modern period it had been believed to be a remedy for headaches, plague, canker sores, vertigo, and jaundice. The thistle has been the national emblem of Scotland since the reign of Alexander III (1249–1286) and was used on silver coins issued by James III in 1470. It is the symbol of the Order of the Thistle, a high chivalric order of Scotland. It is found in many Scottish symbols and as the name of several Scottish football clubs. The thistle, crowned with the Scottish crown, was the symbol of seven of the eight former Scottish Police Services (from which a new national Police Service, Police Scotland, was formed in 2013), the sole exception being the former Northern Constabulary. The thistle is also the emblem of Encyclopædia Britannica, which originated in Edinburgh, Scotland. It is also used to symbolise connection with Scotland overseas. For example, in Canada, it is one of the four floral emblems on the flag of Montreal; in the US, Carnegie Mellon University features the thistle in its crest in honour of the Scottish heritage of its founder, Andrew Carnegie. According to a legend, an invading Norse army was attempting to sneak up at night upon a Scottish army's encampment. During this operation one barefoot Norseman had the misfortune to step upon a thistle, causing him to cry out in pain, thus alerting Scots to the presence of the Norse invaders. Some sources suggest the specific occasion was the Battle of Largs, which marked the beginning of the departure of King Haakon IV (Haakon the Elder) of Norway who, having control of the Northern Isles and Hebrides, had harried the coast of the Kingdom of Scotland for some years. Which species of thistle is referred to in the original legend is disputed. Popular modern usage favours cotton thistle (Onopordum acanthium), perhaps because of its more imposing appearance, though it is unlikely to have occurred in Scotland in medieval times; the spear thistle (Cirsium vulgare), an abundant native species in Scotland, is a more likely candidate. Other species, including dwarf thistle (Cirsium acaule), musk thistle (Carduus nutans), and melancholy thistle (Cirsium heterophyllum) have also been suggested. Coat of arms of Nancy, former capital of the Duchy of Lorraine. The thistle, and more precisely Onopordum acanthium, is one of the symbols of Lorraine, together with its coat of arms which displays three avalerions, and the Cross of Lorraine. Lorraine is a region located in northeastern France, along the border with Luxembourg and Germany. Before the French Revolution, a large part of the region formed the Duchy of Lorraine. In the Middle Ages, the thistle was an emblem of the Virgin Mary because its white sap would bring to mind the milk falling from the breast of the Mother of God. It was later adopted as a personal symbol by René of Anjou, together with the Cross of Lorraine, then known as the Cross of Anjou. It seems through his book Livre du cuer d'amours espris that the Duke chose the thistle as his emblem not only because it was a Christian symbol, but also because he associated it with physical love. The thistle and the cross were used again by his grandson, René II, Duke of Lorraine, who introduced them in the region. The two symbols became hugely popular among the local people during the Battle of Nancy in 1477, during which the Lorrain army defeated Burgundy. The Duke's motto was "Qui s'y frotte s'y pique", meaning "who touches it, pricks oneself", with a similar idea to the Scottish motto "Nemo me impune lacessit". Nowadays the thistle is still the official symbol of the city of Nancy, as well as the emblem of the AS Nancy football team, and the Lorraine Regional Natural Park. Carduus is the Latin term for a thistle (hence cardoon, chardon in French), and Cardonnacum is the Latin word for a place with thistles. This is believed to be the origin of name of the Burgundy village of Chardonnay, Saône-et-Loire, which in turn is thought to be the home of the famous Chardonnay grape variety. ^ "Cardueae". Tree of Life webproject. Retrieved 30 October 2012. ^ "Thistle". Merriam-Webster's online dictionary. Retrieved 30 November 2007. ^ W. T. Parsons; Eric George Cuthbertson (2001). Noxious Weeds of Australia. Csiro Publishing. pp. 189–. ISBN 978-0-643-06514-7. ^ Vioque, Montserrat; Gómez, Rafael; Sánchez, Emilia; Mata, Carmen; Tejada, Luis; Fernández-Salguero, José (2000). "Chemical and Microbiological Characteristics of Ewes' Milk Cheese Manufactured with Extracts from Flowers of Cynara cardunculusand Cynara humilisas Coagulants". Journal of Agricultural and Food Chemistry. 48 (2): 451–456. doi:10.1021/jf990326v. ^ Pepping J. Milk thistle: Silybum marianum. Am J Health Syst Pharm. 1999 Jun 15;56(12):1195-7. PubMed PMID 10484652. ^ Laekeman G, De Coster S, De Meyer K. [St. Mary's Thistle: an overview]. J Pharm Belg. 2003;58(1):28–31. Review. French. PubMed PMID 12722542. ^ C. Marina Marchese; Kim Flottum (4 June 2013). The Honey Connoisseur: Selecting, Tasting, and Pairing Honey, With a Guide to More Than 30 Varietals. Black Dog & Leventhal Publishers. pp. 206–. ISBN 978-1-60376-332-5. ^ Technical Bulletin. The Department. 1940. pp. 5–. ^ Takahashi, Masaru; Louda, SM; Miller, TE; O'Brien, CW (2009). "Occurrence of Trichosirocalus horridus (Coleoptera: Curculionidae) on Native Cirsium altissimum Versus Exotic C. Vulgare in North American Tallgrass Prairie". Environmental Entomology. 38 (3): 731–40. doi:10.1603/022.038.0325. PMID 19508782. ^ Eckberg, James; Lee-Mäder, Eric; Hopwood, Jennifer; Foltz Jordan, Sarah; Borders, Brianna (2017). "Native Thistles: A Conservation Practitioner's Guide". The Xerces Society. The Xerces Society. Retrieved 27 August 2018. ^ "Which flowers are the best source of nectar?". Conservation Grade. 15 October 2014. Retrieved 18 October 2017. ^ Grieve, Maud. "A Modern Herbal". Retrieved 3 June 2011. ^ Webmaster, John Duncan (4 April 2009). "Scots History Online". UK: Scots History Online. Retrieved 14 January 2013. ^ "Flowers of Scotland: Thistle". Twocrows.co.uk. Retrieved 14 January 2013. ^ "Why is the THISTLE a Scottish national symbol?". Ormiston.com. Retrieved 14 January 2013. ^ "Scotland Fact File: The Thistle". Visitscotland.com. Retrieved 14 January 2013. ^ Christian Pfister (1908). Histoire de Nancy. 1. Berger-Levrault. p. 554. ^ "Le chardon". Tela Botanica. Retrieved 11 February 2017. ^ "Origine du blason de Nancy". Nancy WebTV. Retrieved 11 February 2017. 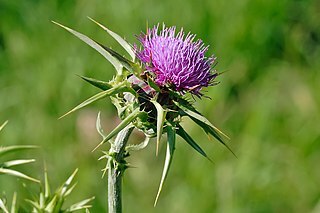 Wikimedia Commons has media related to thistles. Look up thistle in Wiktionary, the free dictionary. Allen, Charles Grant Blairfindie (November 1886). "Thistles" . Popular Science Monthly. 30. "Thistle" . Encyclopædia Britannica (11th ed.). 1911. Centaurea is a genus of between 350 and 600 species of herbaceous thistle-like flowering plants in the family Asteraceae. Members of the genus are found only north of the equator, mostly in the Eastern Hemisphere; the Middle East and surrounding regions are particularly species-rich. In the western United States, yellow starthistles are an invasive species. Around the year 1850, seeds from the plant had arrived to the state of California. It is believed that those seeds came from South America. Cynara is a genus of thistle-like perennial plants in the sunflower family. They are native to the Mediterranean region, the Middle East, northwestern Africa, and the Canary Islands. The genus name comes from the Greek kynara, which means "artichoke". Cirsium is a genus of perennial and biennial flowering plants in the Asteraceae, one of several genera known commonly as thistles. They are more precisely known as plume thistles. These differ from other thistle genera in having feathered hairs to their achenes. The other genera have a pappus of simple unbranched hairs. Onopordum acanthium is a flowering plant in the family Asteraceae. It is native to Europe and Western Asia from the Iberian Peninsula east to Kazakhstan, and north to central Scandinavia, and widely naturalised elsewhere. It is a vigorous biennial plant with coarse, spiny leaves and conspicuous spiny-winged stems. Cirsium vulgare, the spear thistle, bull thistle, or common thistle, is a species of the Asteraceae genus Cirsium, native throughout most of Europe, Western Asia, and northwestern Africa. It is also naturalised in North America, Africa, and Australia and is an invasive weed in some areas. It is the national flower of Scotland. Glebionis segetum is a species of the genus Glebionis, probably native only to the eastern Mediterranean region but now naturalized in western and northern Europe as well as China and parts of North America. Common names include corn marigold and corn daisy. Onopordum, cottonthistle, is a genus of plants in the thistle tribe within the Asteraceae. They are native to southern Europe, northern Africa, the Canary Islands, the Caucasus, and southwest and central Asia. They grow on disturbed land, roadsides, arable land and pastures. Carduus is a genus of flowering plants in the aster family, Asteraceae, and the tribe Cynareae, one of two genera considered to be true thistles, the other being Cirsium. Plants of the genus are known commonly as plumeless thistles. They are native to Eurasia and Africa, and several are known elsewhere as introduced species. This genus is noted for its disproportionately high number of noxious weeds compared to other flowering plant genera. Silybum marianum has other common names including cardus marianus, milk thistle, blessed milkthistle, Marian thistle, Mary thistle, Saint Mary's thistle, Mediterranean milk thistle, variegated thistle and Scotch thistle. This species is an annual or biennial plant of the Asteraceae family. This fairly typical thistle has red to purple flowers and shiny pale green leaves with white veins. Originally a native of Southern Europe through to Asia, it is now found throughout the world. Cnicus benedictus, is a thistle-like plant in the family Asteraceae, native to the Mediterranean region, from Portugal north to southern France and east to Iran. It is known in other parts of the world, including parts of North America, as an introduced species and often a noxious weed. It is the sole species in the monotypic genus Cnicus. Other species once included in the genus have largely been reclassified to Cirsium, Carduus, and Centaurea. A noxious weed, harmful weed or injurious weed is a weed that has been designated by an agricultural authority as one that is injurious to agricultural or horticultural crops, natural habitats or ecosystems, or humans or livestock. Most noxious weeds have been introduced into an ecosystem by ignorance, mismanagement, or accident. Some noxious weeds are native. Typically they are plants that grow aggressively, multiply quickly without natural controls, and display adverse effects through contact or ingestion. Noxious weeds are a large problem in many parts of the world, greatly affecting areas of agriculture, forest management, nature reserves, parks and other open space. The Cynareae are a tribe of flowering plants in the daisy family (Asteraceae) and the subfamily Carduoideae. 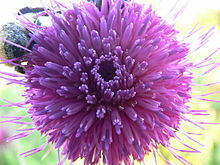 Most of them are commonly known as thistles; four of the best known genera are Carduus, Cynara, Cirsium, and Onopordum. Rhinocyllus conicus is a species of true weevil. It is best known as a controversial agent of biological pest control which has been used against noxious thistles in the genera Carduus, Cirsium, Onopordum, and Silybum. Onopordum tauricum, the Taurian thistle or bull cottonthistle, is a species of thistle. It is native to Eurasia and is known in the western United States as an introduced species. It easily becomes a noxious weed, similar to its relative, Onopordum acanthium. Tebenna micalis, the small thistle moth, is a species of moth of the family Choreutidae. It is found nearly worldwide although in Europe it is found south of the line Ireland, Great Britain, France and Slovakia. In Britain it is an immigrant that occurs irregularly. Outside of Europe, it has been recorded from China, Nepal, Russia, Japan, Afghanistan, Tajikistan, Uzbekistan, Turkmenistan, Canary Islands, North Africa, Arabia, Asia Minor, Zakavkazye, Iran, Lebanon, New Zealand, and the Oriental, Ethiopian, Australian and Nearctic regions. Trichosirocalus horridus is a species of true weevils, native to Europe. 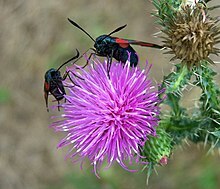 It is a biological pest control agent that was introduced into the United States in 1974 to control exotic thistles, especially in the Cirsium and Carduus genera. Leontodon hispidus is a species of hawkbit known by the common names bristly hawkbit and rough hawkbit. It is native to Europe but it can be found throughout North America as an introduced species.